illus. by Lane Smith. 40p. Chronicle. Apr. 2019. Tr $17.99. ISBN 9781452172781. PreS-Gr 2—As a young black boy is tucked into bed, he imagines both the ordinary and extraordinary things that might happen the next day. Popping with rhyme, humor, and imagination, the text takes readers from a mundane blue sky to a squirrel named Stu and Cousin Todd blowing a kazoo. Lane's mixed-media illustrations add vibrancy to each panel, lending a jazzy, infectious beat to Eggers's lines. Each stanza begins with the phrase "Tomorrow most likely" and rhymes, with the laughable exception of "Tomorrow most likely/something won't rhyme." Perspective plays a tremendous role in the art and text, which helps both the flow and repetition to stay interesting even for older readers. At times, Smith reveals only part of what is happening in a picture or shows the cityscape and then abruptly adjusts to reveal the full picture or zooms in on a detail in the verse. Playful metaphors, such as "you could eat a cloud," are simply fun when combined with the art. 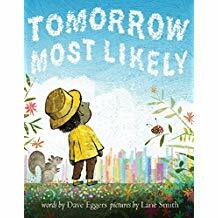 Ultimately, the zaniness wraps with the core message: "Tomorrow most likely/will be a great day/because you are in it" and encourages originality and creativity in children. VERDICT Highly recommended for all collections; an outstanding storytime selection.